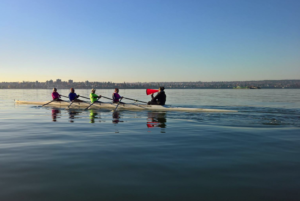 False Creek Rowing Club will be hosting the first in Rowing BC’s Friday Night Challenge Series with a 500m sprint in Vancouver’s beautiful False Creek. Participants will have the opportunity to row next to iconic Vancouver landmarks, such as Science World and Stanley Park, and under all three of the bridges that connect downtown to the surrounding Vancouver area. Participants should arrive at 6:00pm and be rigged and ready to launch by 6:30pm. The event will include two 500 m sprints out-and-back style and, weather permitting, a cool-down row out to Stanley Park. There will be a BBQ at the False Creek compound to follow. The cost of the BBQ is included in the registration fee. If any participants are unable to bring their own boat, please contact Simon Litherland at president@falsecreekrowingclub.ca to arrange a boat rental. Participants can register and pay the $15 fee on the Rowing Canada website under the “FCRC Friday Night 500” event. All participants must be active members of Rowing BC and Rowing Canada Aviron. Even if False Creek is not in your neighbourhood, we encourage you to attend! From Victoria, take the 3:00pm ferry from Swartz Bay to Tsawwassen. False Creek is approximately a 45-minute drive from Tsawwassen. From Nanaimo, take the 12:45pm ferry from Duke Point Tsawwassen or the 3:30pm ferry from Departure Bay to Horseshoe Bay. False Creek is approximately a 30-minute drive from Horseshoe Bay. The address for False Creek Rowing Club is 1655 Whyte Ave, Vancouver. Park in the Vanier Waterside Boat Launch Parking Lot located at the end of Whyte Ave in the car-length spaces (not the extra-long trailer spaces). Note this is pay parking. While you’re in False Creek, take a walk around Kits point, home of the Museum of Vancouver and HR MacMillan Space Centre. Or walk a little further a visit the iconic Kitsilano Beach or visit the shops and restaurants on Granville Island. False Creek has it all!